Atskiras sluoksnis Synfige paprastai suprantamas kaip "primityvus". Pavyzdžiui: sritis, kontūro sritis, importuotas JPEG, ir kt... Tai tau leidžia turėti gerą kontrolę ir lankstumą. Nėra puiku turėti šimtus sluoksnių(žinoma, organizuokite juos hierarkiškai, surūšiuokite). Kiekvienas sluoksnis turi parametrus, kurie nusako, kaip sluoksnis elgiasi. Kai tu paspaudi ant sluoksnio (arba drobės lange, arba Sluoksnių panelėje), tu pamatysi jo parametrus Parametrų panelėje. Synfig Studio turi automatinio atstatymo bruožą. Jei programa palūžta, ar jei failas nebuvo išsaugotas, bus neprarastas daugiau nei 5 minučių darbas. Perkrovimo metu vartotojas automatiškai programos nukreipiamas į neužsaugotų pakeitimų atstatymą. Dėja istorija nėra atstatoma. Šis bruožas ateis vėliau. Vieną dalyką tu pastebėsi, kad Synfig Studio yra lėtas, praktiškai netinkamą aparatūrai senesnei nei 3 metai. Didelė to priežąstis yra visų spalvų skaičiavimai kablelio tikslumu, nes Synfig Studio was built from the ground up with High-Dynamic-Range Imaging in mind. Tačiau, this will not be the case forever. darco has some fairly major re-implementations and optimizations that he plans to implement that should quite dramatically improve the performance of Synfig on all platforms. The goal is not a 200% speed increase, it is at least a 2000% speed increase. With the optimizations that are planned to be implemented, we will be able to pipeline operations in such a way that this performance improvement can be realized. It should also pave the way to hardware acceleration using todays powerful graphics processors, which should yield further performance improvements measurable in orders of magnitude. When you start Synfig Studio, it will display a splash graphic and boot itself up. After it finishes loading, you should see three windows. The window in the upper left is the Toolbox. This is where you can open files, change Tools, etc. You'll notice that most of the buttons are grayed out--because there is no file open yet. The other two windows (one on the bottom, and one to the right) are customizable Dock Dialogs. You can rearrange the contents of these however you wish by simply dragging the tab to where you want it. You can even create a new dock dialog by dragging a tab out of the dock dialog it was inside of. If you ever accidentally close a Dock tab (by dragging it out of the dock dialog, and closing the new dock dialog that gets created), no worries. Simply goto the toolbox and goto "File->Dialogs", and then click on the name of the dialog you need. There are a lot of Dock tabs. If you have no idea what a dock tab does, simply hold your mouse over its icon and a tooltip will pop up describing the name of the tab. Layers Panel - This tab shows you the layer hierarchy for the currently selected canvas. It also allows you to manipulate these layers. Navigator - Shows you a thumbnail of what the currently selected Canvas looks like. You can also zoom in and move the focus around with this tab. History Panel - Shows you the history stack for the current composition. You can also edit the actions in history. If you click the "new composition" button in the toolbox, a new Work Area Window will be opened. Click the caret menu (between the horizontal and vertical rulers in the top left corner of the work area), then "View" then "Properties", and the canvas properties dialog will appear. The canvas properties dialog is a mess, I know. I'll have it re-designed into something much more comprehensible some time in the future. For now, ignore the "Image Area" and "Locks and Links" sections. If you click OK, the canvas properties dialog will disappear and you will see the Canvas window. This window represents the Root Canvas, not that that means much to you at the moment, but that's OK--I'm just trying to show you around. Let's create something so that we can tweak with it. Now that you have a new composition open and the properties dialog is out of the way, go over to the toolbox and click on the circle tool. (If you don't know which one it is, just mouse over them until you find the one with the tooltip that says "circle"). The second you click on the circle tool, you should notice that the Tool Options Panel changed. But we'll get to that later. Note: Some laptop users might experience trouble where click-drag on the canvas when using the circle tool doesn't seem to do anything or produce insanely huge circles. The problem is that Synfig has detected the touchpad and enabled that device (incorrectly!) To fix this: click File->Input devices... In the resulting dialog window, select 'Disabled' for your touchpad device. After this change, your external mouse and the touchpad will work as expected. With the circle tool selected, you can now create circles in the Work Area. This pretty much works exactly as you might expect it to. Go ahead and create two (or more, if you fancy) circles. If by accident you just clicked on the canvas instead of clicking and dragging (with mouse button pressed) to draw the circle, you end up creating a circle with 0 radius and it is effectively invisible! No need to worry, you can easily fix this. In the Params Panel, you can change the parameters of the selected object. If you just made a 0 radius circle, it should be the current selected object. you can change its radius to some value other than 0, say 10, and manipulate it to your liking with the canvas ducks later. Now go back to the toolbox and click on the normal tool (the blue circle with the arrow on it). After you do this, click on one of your circles. You will then see a Bounding box(which is kinda useless at this point in time, but I digress), a green dot at the center, and a cyan dot on the radius. Those dots are called Ducks. If you want to modify the circle, grab a duck and drag it around. Easy! So you can select a Layer by clicking on it. If you want to select more than one layer, hold down CONTROL while you are clicking -- this works in both the Work Area and the Layers Panel. Try it! You can also select multiple ducks. You can do this in several ways. First, you can hold down CONTROL and individually click the ducks that you want selected, but this can be tedious. However, there is a much faster method -- just create a selection box by clicking the mouse and dragging it over the area of ducks that you want selected. Go ahead and select two circles, and select all of their ducks. With several ducks selected, moving one duck will move all of the ducks. This behavior is dependent on the normal tool. Thus, a more descriptive name for this tool might have been the "move" or "translate" tool. The rotate and scale tools work much like the normal tool, except in the case where you have multiple ducks selected. It is much easier to just try it than read about it. Select a few circles, select all of their ducks, and try using the rotate and scale tools. Note that, unlike the normal tool, the other duck manipulation tools DO have options associated with them. If a particular tool isn't doing what you want, take a look in the Tool Options Panel to see if it is set up like you want it. Now let's try Linking. Let's say we always want these two circles to be the same size. Select two circles, and then select both of their Radius ducks (the cyan dots). To select multiple ducks, either drag a rectangle around them, or select the first one, then hold the Control key while selecting the rest. Once you have the two radius ducks selected, right click on either duck and a menu will pop up. Click on "Link". Boom. The parameters are linked together. You can prove it to yourself by selecting just one of the circles and changing its radius -- the other one will change as well. Neat stuff, eh? Linking is a fundamental concept in Synfig. You can create links not only between ducks, but also between parameters as well by selecting multiple layers, right clicking on the parameter in the param tab, and selecting "Link". Let's say you want one of the circles to be a different color. If you look in the toolbox below the tools, you'll see the foreground/background color selector, the outline width selector, and some other stuff like the default blend method and gradient. The foreground/background color widget works exactly as you might expect -- you can click on the foreground color, and a modest color chooser will appear. Now to can change the color pretty easily. But sometimes you just want to click on a color and go. 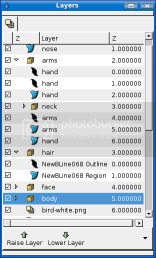 This is where the palette editor tab comes in. Its functionality isn't quite 100% yet (ie: saving and loading custom palettes hasn't been implemented yet), but the default palette is pretty decent. Click on the Palette editor tab and have a look -- it's the one with the palette-ish looking icon. Clicking on colors in here will immediately change the default foreground color. That's all great, but we still haven't changed the color of the circle. There are two ways to do this. The first way is that you select the circle layer you want to modify, goto the params tab and double click on the color parameter--a color selector dialog shows up and you just tweak away. But let's say you already got the color you wanted selected as the default foreground color. Easy. Just click on the "Fill tool" from the toolbox, and then click on the circle in the canvas window. Boom. Circle changes color. This works with more than just circles, but we'll get to that in a sec. Try playing around with the circles for a bit. Muck around with the parameters, and see what happens. To get you started, play around with feather a bit. Of course, so far you just found out how to use the basic features of Synfig Studio but not how you animate a drawing. This is covered in the next tutorial. This page was last modified on 20 February 2010, at 05:46.